Kendriya Vidyalaya Sangathan (KVS) is soon to release the KVS Recruitment Notification 2018. As per the notification, candidates have to appear for written exam for PGT, TGT, and PRT Teaching jobs. KVS Teachers Selection scheme is divided into different tiers, first, there is a Written Exam and then an Interview will be taken of the successful candidates. For the Written exam, KVS Recruitment Notifications has a prescribed syllabus, knowledge of KVS Syllabus and KVS Exam Pattern for PRT, PGT, TGT is essential to crack the exam. 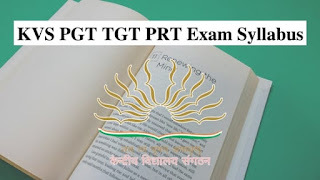 So, we are sharing the detail syllabus of KVS PGT TGT PRT Exam 2018. Time duration for exam 150 min. (5) Subject concerned (Syllabus for the concerned subject is on the official website. These 5 topics are very important when preparing for competitive exams. A candidate should prepare for these topics well in advance. These topics are very much scoring to qualify the exam. Here is a detailed syllabus & study material for these topics are given.